5 - 5..........Vello von Fürstenfeld. 1994: 99-97-99 = 295 points (1st). 1991: 97-90-91 = 278 points (11th). 1989: 100-86-96	= 282 points (9th). 1991: 99-93-92 = 284 points. 31/08/1991: 99-97-96 = 292 points (2nd). 31/03/1992: 98-96-96 = 290 points. Bandit vom Teufelshof was the winner of the D.V. 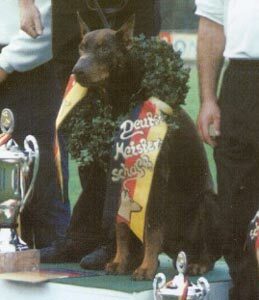 Meisterschaft in 1994 with 295 points. His sire, Akim von Vaciweba, and maternal grand-sire, Ali von Langenhorst, both passed the Körung 'for life' with highest rating for hardness and working drives (very pronounced protective instinct and courage). Hesta: dam of the vom Teufelshof “M, N” litters. Kyra: foundation female for the von der Zonser Heide kennel in Germany and dam of the “A, B, C, D, F” litters (Cher).